Kingpin is a full-flavored Double Red Ale that doesn’t take any lip. It showcases the spicy tone of the Liberty hop, grown in Oregon’s Willamette Valley. We start with Malted Rye and Caramel Malts to create its dark red color and distinctive dry character, then triple hop at three stages during brewing…all for an offer you can’t refuse. A: Clear amber in color. About a finger of white head that fades quickly to a thin film. Decent lacing. S: Not much happening here. Some sweet malt and floral hops. Pretty faint. T: Taste isn't too bad. Sweet and biscuit malts with bitter hops on the backend. Floral/herbal hops are nice. Weird for a beer with no smell to taste good. M: Medium bodied, almost full. Good carbonation. D: The alcohol is present, but not overpowering or distracting at all. Pretty tasty. I could drink a couple of these and be just fine. A- Pours a deep amber from the 12oz bottle into a tumbler with a murkiness and visible chunks suspended in the brew. A thick, fluffy off-white crown flies up to over two fingers with good retention. Massive pillows of lace at the top of the glass followed by big webs and drizzle. S- A balance is struck here between malts and hops probably just a bit shaded toward the grains. Toasty and caramel malts lead off with citrus and herbal hops rounding it out. Bready yeast. T- Bitterness opens up here and provides some depth to the hops which provide orange peel, herbal tea and floral notes. Caramel, toasted, slightly nutty and spicy malts with just a hint of fruit and some bread coming from the yeast. MF- Medium bodied overall with a foamy overall texture. Carbonation comes in at a medium-high level and it all finishes with a bitter bite. A balanced Amber that masks its ABV well and presents a balanced flavor between bitter orange zesty hops and toasted Amber grains. The rye adds just enough spiciness without drowning out the other flavors in the beer. This beer pours a red amber color with a slight amount of off white head that doesn't cling to the glass much. The aroma is missing... There's not much there, but if I imagine I can maybe come up with some fruity hops. The taste starts and ends malty, but very plain with a little hoppy bitterness thrown in there. For a beer that is so-called 'triple hopped' it is certainly lacking in the hops big time. The mouthfeel is about average. Overall I wouldn't really bother with this one unless you need to. Picked some of these up in Arizona. Dark red and amber color, below average head, creamy texture and appearance to it. Aroma was slightly hoppy, had that mildly sweet and dry irish malt thing going. Decently hopped taste, toffee, irish moss and/or malt seemed evident, mild grapefruit tinge from the hops. Hides 7.5% alcohol well. For the triple hopping claims, falls short of hoppy expectations, but still remains a solid choice at the price. ($8/6). More bitter than almost any red ale short of nugget nectar. Served in a Lagunitas mason jar. We talkin' Michael Clarke Duncan or that fat white guy? Regardless, this stuff pours a sunset russet-amber topped by a finger of lightly off-cream-white foam. The nose comprises toffee, caramel, orange zest, ruby red grapefruit peel, and a hint of greens. The taste holds notes of dried maple syrup, light grapefruit peel, light caramel, and an overarching surge of some blandly bitter citrus rind. Let's be blunt, indeed. The body is a light medium, with a light moderate carbonation and a dry finish. Overall, a pretty sad beer, one that has no idea of balance, let alone quality flavor expression. It appears light brown/red with a small off white head. It smells slightly of citrus, mild caramel malt, I get a strong grapefruit smell. There is also a nice grassy hop smell as well. It tastes initially of citrus fruit: I get a lemon and orange zest flavor. I get a bit of a dry bread like malt taste. I also get a bit of a grassy hop flavor. A smooth hoppy bitterness finishes the flavor of the beer. The drinkability of this beer is half decent. I could drink a few of these. Though due to the heaviness of the beer I could only drink two. Not a bad beer but not great either. It is a forgettable beer. Poured into a wide flute glass. Deep red color with a thick, finger and half of tight dirty head. Really well put together. Big malt nose, small lemon and grapefruit, banana at the end. This is a bold taste. Lots of malt balanced with an equal large dose of hops. The bitterness wins out at the end with an uppercut to the tongue. It is a little unruly but worth it. Smooth and creamy texture with low carbonation. Works really well. A straightforward and bold flavor. Beautiful to look at. An enjoyable and different amber ale. Served in a shaker pint at the Mellow Mushroom. Burnt orange and slightly hazy. The creamy medium-tan head of foam descends slowly, leaving thick walls of lace and a concentrated top layer. Sweet and rather fruity in the nose. Lots of peach, caramel, apricot. Hints of nuttiness and just a bit of toast. Lightest hints of earthy hops. A bit sweet. Much bigger bitterness here, marked by earthy hops with a hint of pithy citrus. Caramel and burnt toast mix with apple and peach. A nice toffee sweetness emerges as it warms, but I get a weird tang and abrasive hops as I near the bottom. Spritzy finish. High carbonation is a bit painful, but the body’s a nice, hefty medium. Fairly clean finish, though bitterness lingers hard on tongue. Overall, Kingpin exhibits qualities both good and bad. Not Bridgeport’s best, but not their worst either. Poured from a brown 12 oz. bottle. Has a dark brown color with amber hues and a 1/2 inch head. Smell is of hops, caramel malts. Taste is identical to the smell, hops up front, malts at the finish, well balanced. Feels medium bodied in the mouth and overall is a pretty good beer. 12 oz. bottle, no bottled on date present. A - Pours a reddish copper color with about 1 finger worth of head. Looks very yummy. S - Slight hops, slight malts. Nothing too extraordinary. Some hint of spice smell in there. Booze smell seems to creep out as the beer warms. T - Creamy, bitter, hoppy. Kind of a vanilla oak flavor going on in the finish. A very tasty imperial red ale. M - Bitter, crisp, clean finish. A well balanced beer. Overall, I have been impressed with the three beers I have tried from Bridgeport so far and am looking forward to trying more, since they have all been decent. 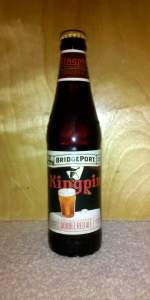 Bridgeport Kingpin Double Red Ale ---4/5.